65-year-old male with a history of a fall at home with a workup that revealed a fracture of the odontoid process. The fracture was a posterior oblique type with an 8.0 mm posterior displacement. The patient was neurologically intact and was kept in an Aspen collar at all times prior to surgery. 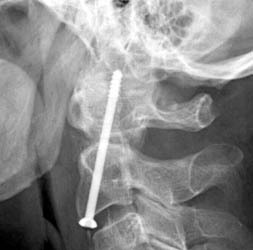 Given the amount of displacement of the odontoid process and the patient's age and reluctance to wear a halo, it was decided that an odontoid screw would be a good option for this patient. Lateral radiograph obtained one day after surgery to assess for adequacy of reduction and screw placement. The film shows a threaded fixation screw coursing from the inferior endplate of C-2 up through the tip of C2 with only two of the threads actually within cortex with at least 8 mm of hardware protruding beyond the cortex of C2 superiorly and the degree of protrusion posteriorly into the canal appears to be 5 mm at its greatest extent.